Christo’s Running Fence bisected the town of Valley Ford, though its flow was interrupted by Highway One, 1976. Our organization’s region of interest encompasses both northwest Marin County and a portion of southwest Sonoma County. A geographic area probably not defined on any map, the boundaries of what we call the Shoreline Region were inspired by the original district of Tomales Joint Union High School: from the Point Reyes Peninsula along Tomales Bay, north along the coast and east to Valley Ford, Bodega Bay, Bodega, and Bloomfield. A late 19th century view of the once busy Lower Town, Tomales, looking south toward intersection of Highway One and Tomales‒Petaluma Road. The center building is still extant, its straight false front now gabled. The large building at right was the American Hotel. From the Coast Miwok Indians who originally occupied this land, through the earliest explorers and the pioneer settlers, to those who arrived in the early years of the 20th century and later, our region has a varied and remarkable history. Connected in the early years only by sometimes impassable wagon roads and often dangerous waterways, the area’s inhabitants were self sufficient and resourceful. The towns, villages, and ranches they developed and where they worked still, in many places, bear their marks. 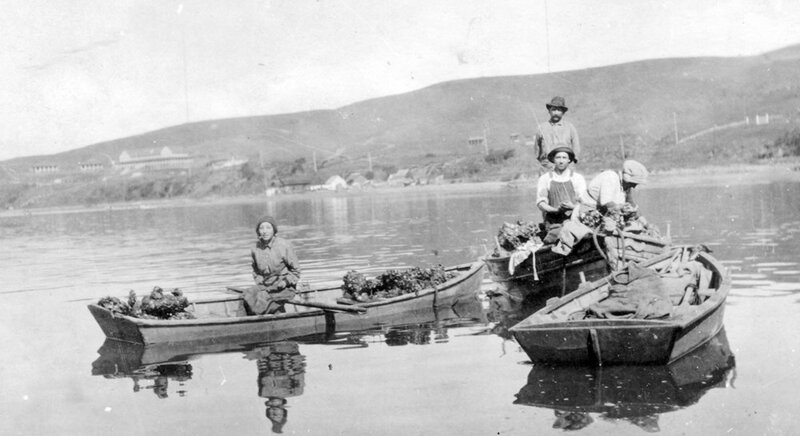 Members of the well-known Smith family of fishermen, harvesting oysters in Tomales Bay, circa 1917. The Marconi Wireless Telegraph Company is just visible in the distance at left. 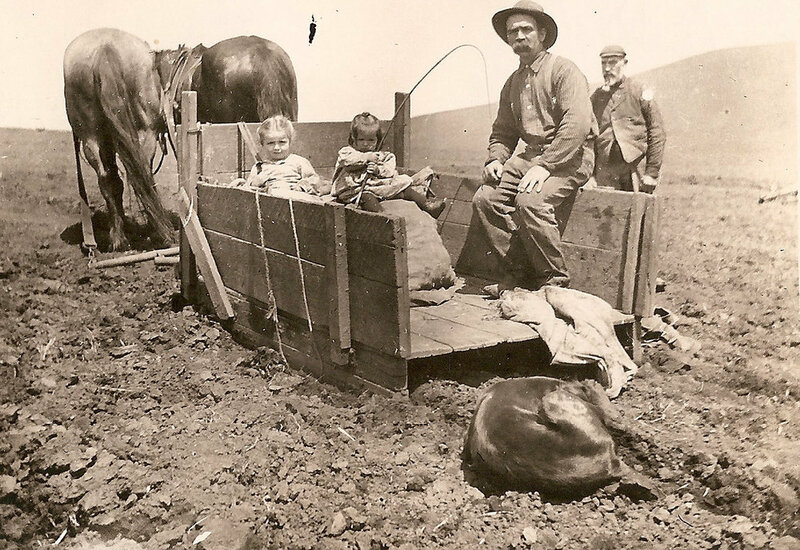 A. D. Hopkins with daughters Doris and Annie, harvesting potatoes near Tomales, circa late 19th century. Pioneers grew grain and potatoes on the hillsides around Tomales and Bodega, and the early dairy ranches along both shores of Tomales Bay were a portent of things to come for the entire region. Thriving ports operated out of bays and estuaries from which agricultural products were shipped to the booming city of San Francisco, full of forty-niners anxious for the taste of fresh butter and eggs. The narrow gauge railroad, operating from 1875 through 1930, helped the isolated region grow and develop, and gave many an introduction to the relatively far off "wilds" of Marin and Sonoma Counties. Tomales railroad depot was just west of Carrie Street. Circa 1920 photo by Ella Jorgensen. Five houses on the west side of Tomales’s Maine Street (Highway One). The side-gabled houses all date from the 1860s ‒ the early1880s; the shingled, front-gabled house is brand new, still without most of its trim work. Note the hitching rails at some front gates. Photo by Ella Jorgensen, circa 1915. The town of Tomales is notable for its collection of intact early architecture, the diversity of which reflects the evolution of the village. From the earliest vernacular houses and Italianate commercial buildings to the simple Queen Anne cottages, from early 20th century industrial buildings, Craftsman style houses, and Spanish Colonial Revival school to the pair of 1960s-era duplexes, the architecture of Tomales is a study of the town’s past. Though few of the buildings are architect designed, the unaltered parts of most of them exhibit an honest dignity of style and proportion. (An example of this is the "slit post" seen on several houses: an unpretentious, economical, yet decorative use of plain lumber to function as porch roof supports.) The primary theme which runs through these disparate styles and unites them in harmony is their modesty of style and scale. Between the 1906 earthquake when four masonry buildings were demolished (including a stone Richardsonian Romanesque church) and a 1920 fire that burned sixteen mostly commercial buildings, much of significance was lost. The brand new stone Catholic church at Tomales, built to replace the wood frame Church of the Assumption. Photo by Ella Jorgensen, circa 1900. 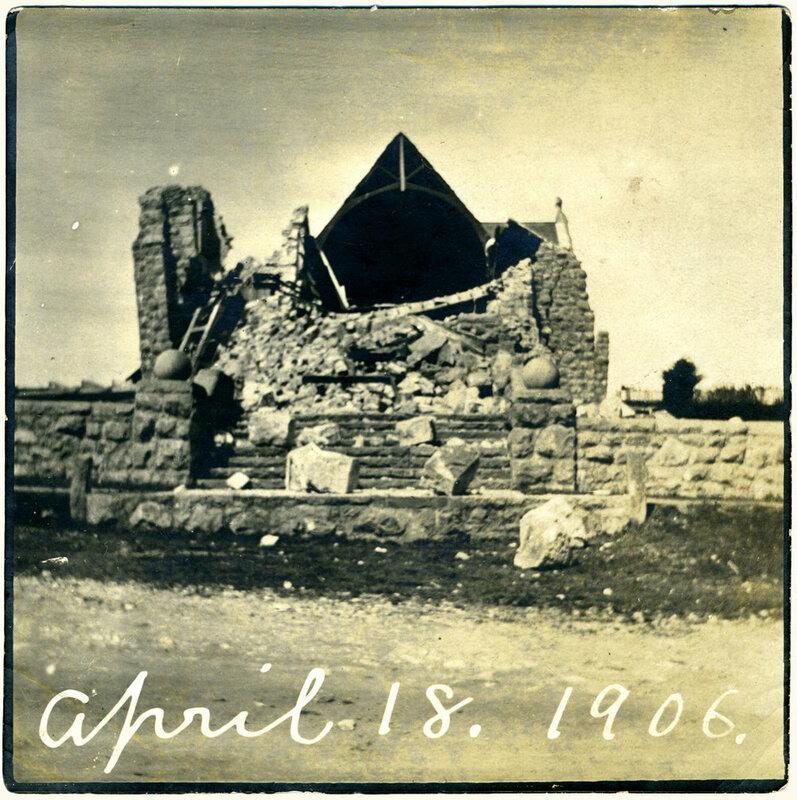 Ruins of the six-year-old stone church, demolished by the 1906 earthquake. (The smaller, wood-frame church built in 1860 still serves its congregation today.) Photo by Ella Jorgensen, circa 1906. A high degree of architectural and historical integrity is evident here, and early photographs of the town seem strikingly similar to the Tomales of today. The integrity of both the built and the natural environment of Tomales lends life and depth to what we know of the area’s history. A view west from First Street across Highway One, Upper Town Tomales’s main intersection, a few years before a large fire destroyed sixteen buildings, including the hotel on the corner, one just visible behind it, and the livery stable in shadow, all at left. Photo by Ella Jorgensen circa 1916. Download this PDF for a self-guided walking tour. The buildings and sites of Tomales tell much of its story in a tangible way. They also illuminate today’s profound connections to those earlier times, and to the ongoing continuum that is ever becoming History. Our self-guided Walking Tour of the Village of Tomales — available at the museum and here in PDF form — will guide you around the four-square-block town to view 50 of its historic resources, learning something about each.